This tutorial will show you how to measure the TDS value of the water. Please read this tutorial carefully, and pay attention to the steps and details. The probe can not to be used in water above 55 degrees centigrade. The probe can not be too close to the edge of the container, otherwise it will affect the reading. The head and the cable of the probe are waterproof, but the connector and the signal transmitter board are not waterproof.Please pay attention to use. After uploading the sample code,open the serial monitor of the Arduino IDE. Then insert the TDS probe into the water, and gently stir it. Waiting for the reading to be stable, and you will get the TDS value of the water. Through the basic tutorial, the TDS value of the liquid can be easily measured. However, due to the individual differences of the TDS probe, the difference of the main control board, and without temperature compensation, the measured value will cause a little big error.Therefore, to obtain a more accurate TDS value, calibration is required before measurement. In addition, it is recommended to connect a temperature sensor for temperature compensation to improve accuracy. Normally, the TDS value is half of the electrical conductivity value, that is: TDS = EC / 2. The wiring diagram is same as the basic tutorial. During the calibration, the liquid solution of known electrical conductivity or TDS value is needed, such as 1413us/cm standard buffer slution. If converted to a TDS value, it is about 707 ppm. The TDS value can also be measured using a TDS pen if you have not the standard buffer solution. The following will demonstrate how to calibrate. 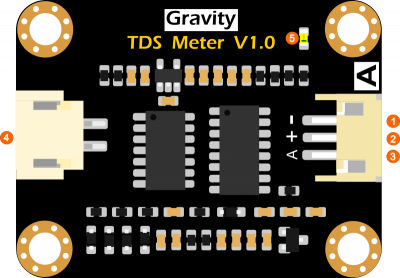 Download and install the DFRobot Gravity TDS Sensor Library. How to install Libraries in Arduino IDE? This sample code shows how to read the tds value and calibrate it with the standard buffer solution. 707ppm(1413us/cm)@25^c standard buffer solution is recommended. All above must be included in any redistribution. 1. 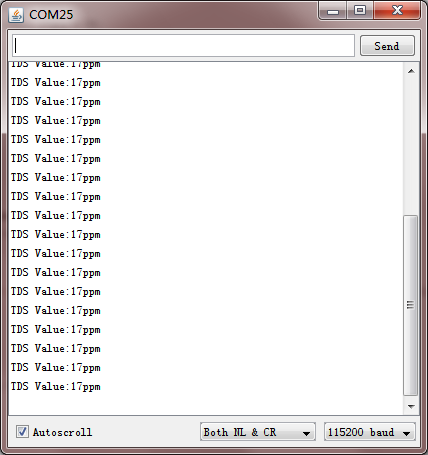 This code is tested on Arduino Uno with Arduino IDE 1.0.5 r2 and 1.8.2. Uploaded the sample code to your controller board, then open the serial monitor. Clean the TDS probe, then dry it with the absorbent paper. Insert the probe into the buffer solution of known electrical conductivity or TDS value, then stir gently, waiting for stable readings. If you have not the standard buffer solution, a TDS pen can also measure the TDS value of the liquid solution. Input command "enter" to enter the calibration mode. Input command "cal:tds value" to calibrate the sensor.In this example, I use the 707ppm buffer solution, so I need to input command "cal:707". Input command "exit" to save and exit. After the calibration, you can use the TDS sensor in your application now. Q1. Does this sensor have a temperature sensor? How to make the temperature compensation? A1. This TDS probe has no temperature sensor, but the temperature compensation algorithm is reserved in the sample code. The temperature variable in the sample code will default to 25 °C without a temperature sensor. 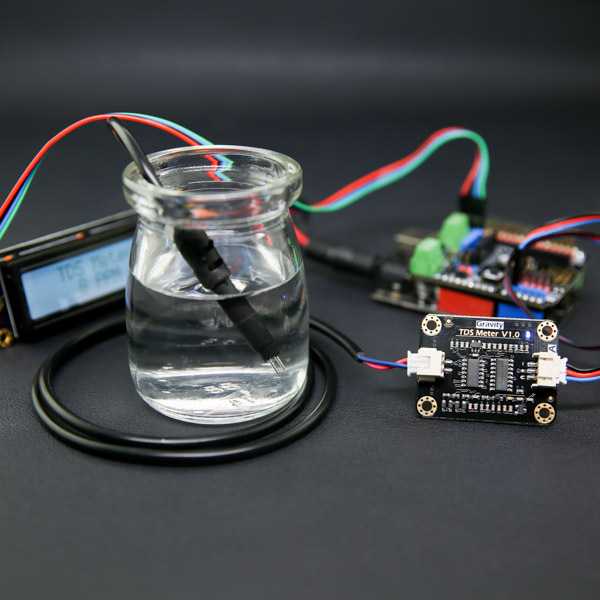 You can add a waterproof temperature sensor to read the temperature,then update the temperature variable, to make automatic temperature compensation. 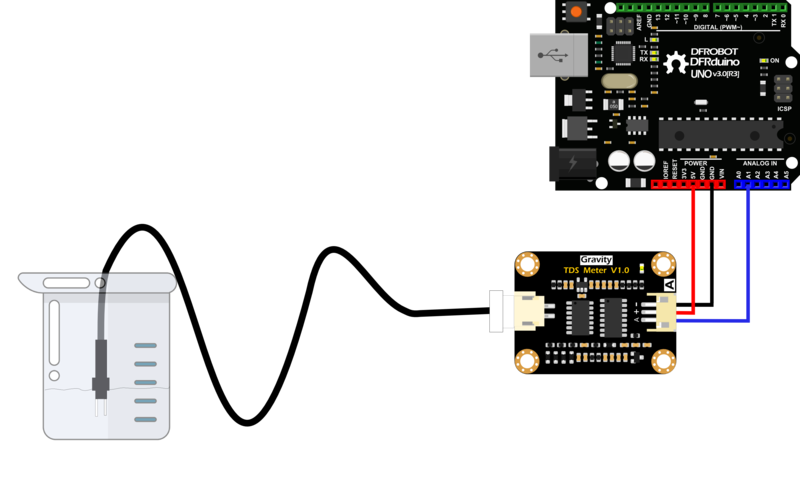 Get Gravity: Analog TDS Sensor/Meter for Arduino from DFRobot Store or DFRobot Distributor.